Once or twice a year, esteemed radio show This American Life (TAL) transforms itself into a show that you can not just see with your ears, but one you can see with your eyes: they put on a live show in a theatre. That live show is then broadcast to other theatres—live in the US and Canada and on a slight delay to here in Oz. It’s kind of fitting, then, that the show’s overall theme was making that which is invisible, visible; the first two segments were especially so. They featured artists who were blind and who told hilarious stories of trying to orientate yourself and find a telephone in an unfamiliar hotel room and of explaining your blindness to your toddler. The subsequent segments/acts included such tales as how Taylor Dane is the most easily found celebrity ever and a dance that defies description but that had me cacking myself so hard I had to stifle a snort. OK Go also impressed with an outstanding smartphone app and interactive song that had us giggling and playing, stomping, and clicking along. Then there was an artist who wasn’t actually an artist—she was a nanny whose penchant for taking photos was discovered after her death. The thing is that her black-and-white images, of which there are hundreds of thousands, are so striking each one alone warrants display in a gallery. TAL described her as an Emily Dickens-like character, whose success came posthumously. Given her penchant for privacy and the fact that she’d never shown the images to anyone it’s unlikely we’d have seen the images were she still alive. Either way, I could have watched a slideshow of her images for hours. I’ve got to admit that my bladder got the better of me. The radio show is normally around three acts long and that’s what I (and my bladder) expected. Turned out the live show was six acts long and, well, suffice to say I didn’t enjoy the second half as much as I did the first. It may have had something to do with the fact that two segments fell a little short of my over-hyped expectations. At least, one did. Mike Birbiglia is my favourite contributor—his sleepwalking and boyfriend’s girlfriend stories are ones I’ve re-listened to a thousand times and quote regularly. He created a short film for the show, though, which wasn’t his usual insightful and funny. It was ok (and I mean ok in the way that you draw out the ‘o’ and then the ‘k’). It started strongly, with the camera focusing on the soundboard and Mike talking about his serious sleep disorder off camera. I wanted to hear more about it—serious, funny, whatever. It’s his breakout story and one of which I never tire. Instead he went off into a fictitious, arguably slightly clichéd short film that relied on repeating a single gag in different settings. It was, eh (and I mean eh in the way that you kind of appreciate the gag but are non-committal about the film overall). The second not-my-favourite segment was by David Rakoff, although I should qualify that with the fact that I’m not a fan and always find his stories run a little long for my taste. It finished with an interpretive dance that made me cringe even more than the tale. Still, he had a great moment where he recounted how to grate cheese when you only have one arm that works—it was so clever it warranted applause. Realistically, two segments that don’t 100% work are par for the course with TAL (and above average for creative works in general). It experiments so much and yields so much that’s outstanding that it’s bound to have (and should be allowed) the odd small fail. Double thumbs up to this live show. I can’t wait for the next one. I had grand plans to write a brilliant blog based on snippets of intellectual gold I’d gleaned from Ira Glass’ mouth. Instead I bring you illegible handwriting scrawled on my it’s-summer-in-Queensland sweaty hand (see Exhibit A, pictured above). I blame the lack of profundity on the fact that my seat was, through no deliberate booking effort of my own, just three rows from the front and on the aisle. I had my notepad out and pen poised, but felt incredibly self-conscious about it. Never more so than when Glass noticed it and me and we had a brief moment of eye contact (and yes, everything about him kind of made me melt). I’m sure he didn’t mind me taking notes and was probably actually quite pleased about it. His show is, after all, called Reinventing Radio and in it he does reveal the secrets to his and This American Life’s (TAL) success in order that many more good radio shows and segments can be produced—he wants us to take the information away and do something with it. But I am too shy, too in awe of Glass, and was too worried he’d later single me out in a kind of this-audience-member’s-taking-notes spotlight to keep it out. 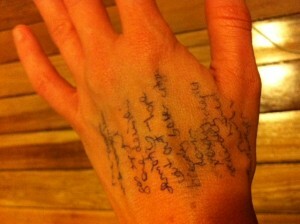 So, notepad went away and uneven, slightly sweaty surface of the hand took its place. The problem is that I can’t decipher the dodgy notes I took in my dodgy handwriting in the dark. Sigh. The only word I can truly make out there is semiotics, as in the study of signs and symbols and how they’re used or interpreted. You know, subtle cues such as how Darth Vader was in all black and his identity was concealed by a robot head while Luke and Leia are dressed in angelic white. It was what Glass majored in at uni and that no one ever thought he would use. The irony is that he uses it all the time in his role as host/producer/writer/interviewer/creative genius behind knockout radio show TAL (it kind of reminds me of Steve Jobs studying the seemingly waste-of-a-subject calligraphy then going on to create iconic Apple fonts). If you haven’t listened to TAL and are not sure what I’m talking about, now’s the time to step away from this blog and to download the podcast or, better yet, the TAL app. Then start working your way through the podcasts. The show will completely change your life and you’ll wonder how you ever survived without it. I realise that sounds gushy and hyperbolic and a bit like I’m about to throw in some free steak knives with that. Please, just trust me. Especially as I can’t articulate just why TAL and Glass are so incredibly brilliant. Indeed, I’m exceedingly frustrated that I can neither work out what I wrote nor recall what Glass said (if you can read my handwriting, let me know—whatever I wrote down, I was at the time convinced it was must-not-forget profound). In truth, I feel like that after most of the TAL shows. The concepts are so brilliant and so brilliantly executed I can’t possibly explain or recreate them. Instead I say, go listen to the show. And then re-listen to it. TAL is unlike any other radio show you’ve ever heard. Its emphasis is on storytelling. It is, effectively, like writers writing for radio. That was pretty much the sentiment shared when we ran into friends outside and spent hours discussing which TAL episodes were our favourites. The previous week’s episode had just been an hour-long Apple factory expose. We puzzled over the simple-yet-effective storytelling techniques—the show was a slowly told, minimally emphasised monologue, which had the potential to be boring but had the opposite effect: we hung on every word. Then we discussed some of the classics, not least Mike Birbiglia’s sleepwalking and boyfriend’s girlfriend’s tales. Sigh. I’m not exactly espousing intellectual gold here. So, without notes to convey I’ll simply say that the synopsis of this blog is that Glass was incredible and the night incredibly inspiring. I came away with ideas and inspiration too plenty for a Thursday night (the temptation to call in sick to a client’s on the proviso that I had creative projects I absolutely had to work on was almost too great). If you went to the show and recall those elusive gems I no longer can, please feel free to post them below. If Glass is heading to your town anytime soon, I recommend you see him and his show. Christmas Eve brought with it the arrival of a book I’d ordered months ago. As with almost everything, it was already available in the US, and I wasn’t entirely sure when the Australian release date was. So, it was something of a pleasant and perfectly timed surprise to find this book on my doorstep. I also knew without a shadow of a doubt that it would be the book I’d be reading on Christmas afternoon and Boxing Day and for which I’d employ my silent, slight frown, and can’t-you-see-I’m-reading head shake when I was asked a question. My brother and I discovered the veritably brilliant American comedian and storyteller Mike Birbiglia via the equally brilliant podcast of This American Life (TAL). We are, unashamedly, now officially and irrevocably obsessed with both and are leading the you-must-listen-to-these charge in Australia (and forget Oprah—rumour has it Birbiglia is heading down under in January). I was well chuffed to find out a few months back that Birbiglia had penned the stories I’ve been fortunate enough to hear over and over and over (they’re so good you’ll want to listen to them more than once), as well as a few I haven’t heard before. 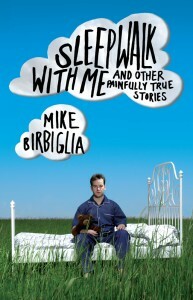 They’re brought together in Sleepwalk With Me And Other Painfully True Stories, a memoir of Birbiglia’s school, university, romantic, comedic, and family life to date. Birbiglia is an everyman, who holds and speaks aloud the very same fears we all have—of not being attractive enough or popular enough, of wondering how on earth to navigate the minefield of potential social and career pitfalls. He does so despite his father’s warning not to tell anyone, and I’m glad he does. He also does it in ways that will have you both laughing aloud and then almost crying within the confines of a single tale. While Birbiglia can write and the book is well worth reading on its own in the traditional, eyes-scanning-the-page style, I’d highly recommend reading it after you’ve become familiar with Birbiglia’s voice and timing. Like David Sedaris (who, incidentally, also regularly appears on TAL), Birbiglia is a master storyteller who brings his stories to life in front of live audiences and over the radio in a manner that, once you’ve heard it, will see you read every one of his stories in that value-added style. The two best stories in Sleepwalk With Me also happen to be the ones I’ve heard many, many times over. So many times over, in fact, that I can just about recite the stories alongside him. There’s the story of his first ever girlfriend, the school bad girl (and antithesis of his nerdy guy) who didn’t treat him so well, and which is a tale that is eerily similar to a relationship experience I’ve had recently. Then there’s the story that lends the book its sleepwalking title, with Birbiglia recounting his experiences prior to being diagnosed with a sleep disorder that sees him act out his dreams. These days he sleeps heavily medicated inside a sleeping bag, wearing mittens so he can’t undo the zip. I haven’t sold either story well, partly because you have to hear them to truly appreciate them, and partly because I don’t want to ruin the surprise. Rest assured, after hearing them (and for which I’ve helpfully included the YouTube links), you’ll want to read the book. You’ll also punctuate conversations with the likes of ‘Yeah, yeah, nice, nice’, ‘Abbie! There’s a jackal in the room!’, ‘I was feeling pretty good about myself because I was new to the sport’, and ‘I’m the hulk, I’m the hulk, I’m the hulk’. Some weeks ago I asked about the merit or otherwise of re-reading books, but have since realised that I’ve forgotten one key reason for re-reading: excellent authors who have released few books. It starts with a book recommendation or a simple stumbling across a writer whose fabulousness you can scarcely believe and whose writing you wonder how you previously existed without. It finishes with a mad dash to find and devour their back catalogue of books. Which is great, until you exhaust the supply. Then begins the trawling of the internet and the author’s and publisher’s websites to find out if or when the next book will be released. When there isn’t the promise of a forthcoming fix, you’re left with the option of either re-reading the published works or reading nothing (ok, or reading something someone else wrote, but bear with me here). In spite of my reluctance to revisit books—largely because I worry that re-reading one book means potentially never reading another in this lifetime—after writing the blog about it I found myself lured back to Jon Ronson’s works. He’s best known for The Men Who Stare At Goats, which was recently made into a film that I haven’t yet seen. But my favourite of his books is the simply titled Them: Adventures with Extremists. Ronson (whose name I constantly have to check in my head as I can never remember if it’s Jon Ronson or Ron Jonson; and even though it’s the former, it’s the latter that always springs to mind) is a creative non-fiction writer and journalist with a knack for finding the interesting in the apparently ordinary. I spend half my time marvelling at how and where he finds his subjects and stories and the other half at how powerfully he conveys them through understated writing. For example, in The Men Who Stare At Goats, Ronson investigates a secret, unacknowledged arm of the American army dedicated to researching how mind power can give them the upper edge. These are the super-educated, super-intelligent men who try to walk through walls or who stare at goats in an attempt to will them to drop dead (for the record for other animal lovers out there, they weren’t overly successful—one goat fell over once). In Them, Ronson seeks out and embeds himself in the daily lives of the people we’d label ‘extremists’ and who are, given that he’s Jewish, unlikely to let him in. There’s Omar Bakri Mohammed, who’s living on social welfare in London and who’s both applying for British citizenship and openly plotting to overthrow the UK and turn it into an Islamic country. There’s the media savvy Ku Klux Klan leader who’s trying to preach love for white people rather than hate for black people, and who discourages his followers from wearing the famed hooded outfits or use the N-word. There’s the people who believe that the world is controlled by the Bilderberg Group, which comprises of a small, select group of all-powerful people who meet annually in secret locations. Then there’s David Icke, who actively believes that the world is actually being run by extraterrestrial, shape-shifting giant lizards. For real. Part bumbling Bill Bryson, part David Sedaris, Ronson is a writer and speaker with whom I’ve fallen in love. Which is a problem, because his books take an eternity to research and write. Which means that he doesn’t release them all that regularly. Which means that in the absence of new Ronson releases, I need to revisit his books to get my quota of his writing.